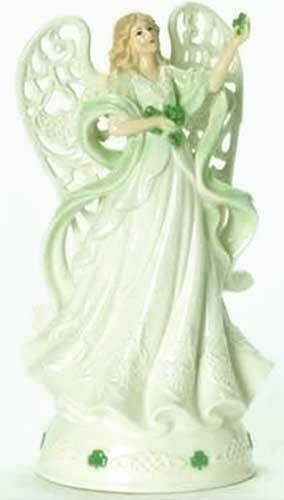 Irish Angel is a musical figurine that features shamrocks along with filigree Celtic knot-work wings. This musical Irish angel winds up to play When Irish Eyes are Smiling. Musical Irish Angel Figurine features shamrocks along with filigree Celtic knot-work wings. The wind up to play Irish angel is enhanced with green shamrocks in her hands and on the base, along with embossed Celtic knots on her gown and also on the base. The Irish angel figurine is made of white porcelain with green accenting; she measures 8 3/4" tall x 4 3/4" wide x 3" deep. The Irish angel is gift boxed with Celtic knot and shamrock history cards, complements of The Irish Gift House. Irish throw blanket features an angel who is holding shamrocks in her hands and she is further enhanced with Celtic knot-work wings. Angel of Protection figurine from Belleek is holding a green shamrock; she would make an ideal Irish baby gift. Irish stained glass suncatcher features a shamrock enhanced angel along with a blessing.